Are you ready to build the home of your dreams? Congrats on this exciting occasion! We love seeing our clients enjoy their home design and construction process. And our Single Loan Close Construction program makes your mortgage process as simple as possible, because you want to focus on the details of your new home (and we can't blame you). What is the Single Loan Close Construction Program? Waterstone Mortgage's Single Loan Close Construction program helps streamline the process of building your dream home and securing permanent financing. 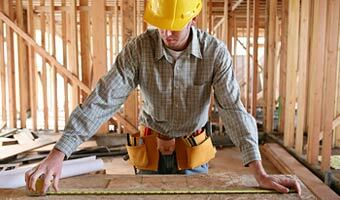 A single loan covers your construction costs and mortgage. One loan. One closing. One easy process. What are the Benefits of This Loan Program? How Can I Learn More About the Application Process for This Loan Program? Contact Waterstone Mortgage today and a qualified home loan professional will walk you through the Single Loan Close Construction program application process and answer any questions that may arise. We'll work with you and your builder from start to finish to ensure a smooth loan process, so you can focus on creating the home of your dreams. Get started by finding a mortgage loan professional in your area! Geographic restrictions apply - contact a mortgage loan professional for additional information. Interim construction period not to exceed 12 months. The interest?only feature allows you to make minimum interest payments for a set period of time. When the interest?only period ends, your monthly mortgage payment will be recalculated to include full principal and interest payments for the remaining loan term.